Compaction Factor Apparatus for Concrete Testing - The apparatus is used for determining the workability of fresh concrete, provided the maximum size of the aggregate does not exceed 38mm. The test is particularly useful for concrete mixes of very low workability where true slump values are not reliable. 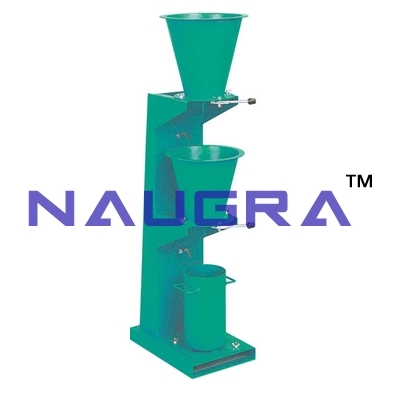 Specification : It consists of two rigid conical hoppers and a cylinder mounted on a rigid metal frame. The lower openings of the hoppers are fitted with hinged trapdoors having a quick release catches. A circular metal plate is provided to cover the top of the cylinder. Supplied complete with one plaster\'s trowel and one tamping rod, 16mm dia x 600mm long, both ends rounded..
We are leading manufacturers, suppliers & exporters of Compaction Factor Apparatus For Testing Lab for Concrete Testing Lab. Contact us to get high quality designed Compaction Factor Apparatus For Testing Lab for Concrete Testing Lab for schools, colleges, universities, research labs, laboratories and various industries. We accept bulk orders for government tenders in all countries around the globe.